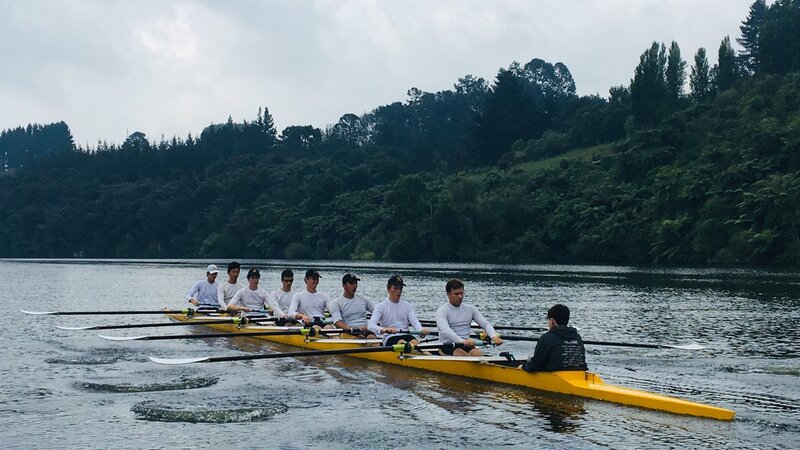 In December, sixteen Grammar rowers and two coxswains ventured to Lake Karapiro in New Zealand to test themselves in a different environment and a world-class setting. The boys were hosted by the St Peter’s School, members of the Cambridge (NZ) Rowing Club. The boys trained hard for four days before the start of races as an U17 VIII, an U17 IV and an U16 4x (quad scull). The U17 VIII performed extremely well in their heat to qualify for the A-final, finishing only one second behind SHORE. The Quad, consisting of Ben Wheen, Jack Sproats, Michael Campbell and Henry Gayst should be congratulated for their selection into two B-Finals. The IV faced tough weather conditions in their two races, and unfortunately did not perform as expected. A week out from the start of the 2019 school year, the senior shed found themselves training night and day for seven days in Canberra. We were fortunate to be housed in cutting edge facilities at the Australian Institute of Sport. The boys were involved in numerous training programs using the Australian National University (ANU) sporting facilities, and ANU Boatshed on Lake Burley Griffin. This served as a great start for the build-up and intensity of the training, culminating in the The Head of the River.